Temari Addict Australia: Answering emails... Which thread? For many of us there is no local needlework store (LNS), we are often left with no other choice than to turn to the Internet for our supplies. This week I got an email from a customer who had a question about the difference between two metallic threads. When I began temari making in Perth the Internet was also my only option. There aren't too many LNS in Perth and those that are here don't carry everything a new temari maker wants and most of the staff behind the counter (while knowledgeable in other forms of embroidery) have never even heard of temari, let alone seen one or know what tools and threads to suggest to a newbie. I guess this is how my online store began. I got tired of never being able to find what I wanted at the store to I started my own small business and the rest is history. Now I carry a range that includes metallic, rayon & cotton threads, needles, v rulers, books and the like. We all have our own favourite threads for stitching temari. Each thread has its own pro/con depending on the projects use, users desired outcome and stitching skill. Here is an image to compare the various threads I have for sale in my store. From this image you can see the thickness of each thread. I've even included a sample of DMC (which I don't sell) so you can compare a thread you are familiar with to others you may not have seen before. In addition to the thicknesses there are other aspects of each thread to take into consideration when choosing which one to use in your project. Cosmo Lame and Nordic Gold while very similar in terms of thickness, are manufactured in different ways. Nordic Gold is a chainette and has a slight stretch when pulled. Cosmo Lame is a braid and it has a slight flatness. Both of these threads are a little thinner than Perle 5 cotton so you need to be aware of it's potential to get lost between lots of tightly spaced rows of stitching. Cosmo Lame is sold in 3 shades in our store, Nordic Gold comes in 14 shades. 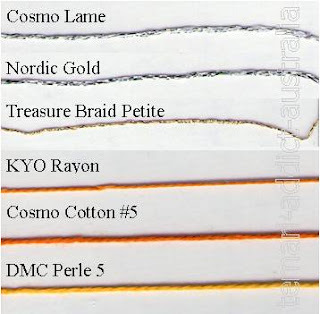 Treasure Braid Petite is substantially thinner than the other metallic threads (although one or two shades are a little thicker than the one in the image). They are made as a braid and are quite strong despite their fineness. They are great for adding multiple lines to a C10 or C8 temari. While I wouldn't stitch with them along side Perle 5 thread, they are great for adding fine detail to outer edges or making small matsuba, stars shape, obi chidori and the like. They work perfectly as a substitute metallic stitching thread when using fine stitching threads (like top stitch quilt or single strand embroidery thread) on tiny and teeny temari. This range comes in more than 70 shades and several levels of shimmer. KYO thread is made with rayon which makes it GLOW on your temari, so much so that taking a really great photograph of temari stitched with KYO is quite difficult. It is thinner than Perle 5 cotton (between DMC #5 and DMC #8) is a little slippery but it is divine to work with as it rarely gets kinks and is quite strong. A good size knot or several zigzags underground at the beginning of stitching will keep it anchored nicely and you'll need a couple of zigzags at the end too. This thread is also available in more than 70 shades. Cosmo Cotton #5 pearl is the thread used in many of the Japanese language temari books. It is softer than DMC so it plumps nicely and knots up much less too. This thread is not very well known to the rest of us but has a long history of usage in Japan and is much loved by Japanese embroiderers, it really is a great quality thread equal to (if not better than) DMC. There are 260 shades in this range. I really like using this thread to stitch my temari and although I don't carry the full range of colours at this stage, I hope to continue to widen the selections available over time. There is an almost infinite variety of threads available to temari makers and the ranges I sell are my favourites. They are the ones I have tried, tested and found to offer the best results for most applications. Visit the Temari Addict Australia supply store for more information of these ranges of threads. My number one recommendation for purchasing threads on the Internet is to invest in a colour chart for the ranges you prefer to use. Purchasing from an image on the screen can sometimes result in disappointment when the 'in person' shade doesn't match the 'monitor' shade and it can throw off your whole design.